COLOR(S): Deep, shiny coal black, without rustiness, and with lustrous tan (chestnut red) markings; black penciling on toes and black streak under jaw is permissible. Muzzle, feet and points on the chest hold the tan markings. A good-sized, sturdily built, black and tan dog, Gordon Setters are well muscled, with plenty of bone and substance. Gordon Setter dogs are tireless workers and enjoy abundant exercise and attention. They are a better watch dog than the other setters, making them a loyal and protective pet. Gordon Setter dogs are lovable, friendly, intelligent dogs who are sensitive and gentle. 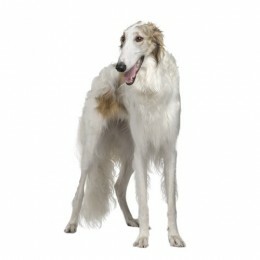 They are, however, slower and heavier boned than the rest of the setter family. But what Gordon Setters lack in speed, they certainly make up for in protection and stamina. Gordon Setter dogs are more suspicious of strangers, and better at guarding than other setters. They also have great endurance, able to go longer without water and work harder in intense heat, more so than their other setter relatives. They are excellent in finding birds, as was once recorded by an unknown writer in the 1700s: "Their noses are first class and they seldom make a false point or what is called at field trials a sensational stand...When they stand you may be sure there are birds." Their excellent noses, heavy bodies and slow moving ways may have been contributed by the Bloodhound. Gordon Setters are medium to large dogs with wavy black and tan coats, of which a red coat may pop up in a litter occasionally. Gordon Setter dogs are excellent in their field skills, have great stamina and have remained a favorite among hunters who wish to fill their game bags. Gordon Setters are an ideal pet for the owner who desires quality and loyalty. Gordon Setter puppies and dogs are obedient, loyal and protective. They are friendly and loving, relaxed and relatively obedient. Gordon Setter puppies and dogs are good companions, but more suspicious of strangers than other setters. They make good guard and watch dogs, as they are loyal to their owners. They are a tireless worker, enthusiastic about a hunt. Gordon Setter puppies and dogs are intelligent, fun loving and affectionate. Short and fine on head, fronts of legs and tips of ears; moderately long over rest of body, flat and free from curl. There is ample feathering on the legs, underbelly and tail. Hip dysplasia, PRA (Progressive Retinal Atrophy), epilepsy. Other health concerns include bloat (twisted stomach or gastric torsion). Bloat is a health issue to most dogs, being the second largest killer of dogs other than cancer, but Gordon Setter dogs can be particularly susceptible to it because of their deep chests. Plenty of regular exercise is necessary to maintain a well-balanced, manageable dog. Long walks and runs are suggested, as this breed can withstand a lot of exercise. Gordon Setter puppies and dogs can be stubborn on occasion, but if you are consistent and loving in your approach they are not difficult to train. Gordon Setter puppies should be socialized early on, however, to avoid any confrontation with pets and children in the future. They are fine with children if socialized.